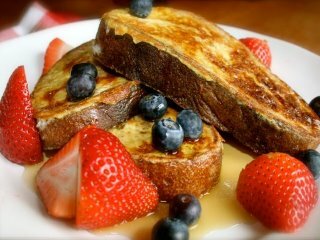 Fruity French toast: French toast is traditionally made out of stale bread. Since bread has been a staple food for most cultures for longer than we can imagine, soaking it in milk and egg then cooking it, seems a logical thing to do. The earliest reference to soaking bread in milk and eggs, dates all the way back to 4th century Rome in a cookbook attributed to Apicius. This style of “French” toast was then called Pan Dulcis. The Romans would take the bread, soak it in a milk and egg mixture, and typically fry it in oil or butter much like the Americans do for breakfast today. 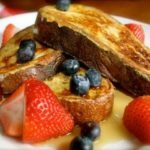 This recipe for French toast with fresh fruit is one of the most popular ways you will see it served. 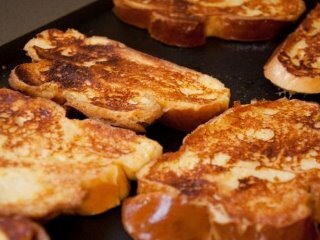 However, we will over time, introduce you to all sorts of things you can do with bread and still call it French toast! Whisk the eggs, milk, vanilla and cinnamon in a bowl to form a custard. Working with 1 – 2 slices of bread at a time, lay slices of bread into the custard, saturating it on both sides. Heat a non stick-pan over a medium to high heat and rub with a small amount of butter or oil. Place the bread in the pan and brown both sides. Set aside and keep warm until all of the bread is cooked. Serve with the fresh berries and warm maple syrup.